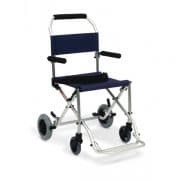 Folding chair chaperoned, aluminum with two front wheels and two rear with brakes. Folding chair for transport, aluminum with two front wheels and two rear wheels with parking brakes. 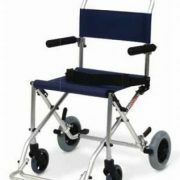 Foldable aluminum chair with two front wheels and two rear wheels with parking brakes.Used for accompaniment.Seat and backrest in blue nylon.Complete with practical handbags.Super lightweight, weighs only kg 8,3.Capacity: kg 100.Height-adjustable arm and footrests.Pelvic Containment Belt.